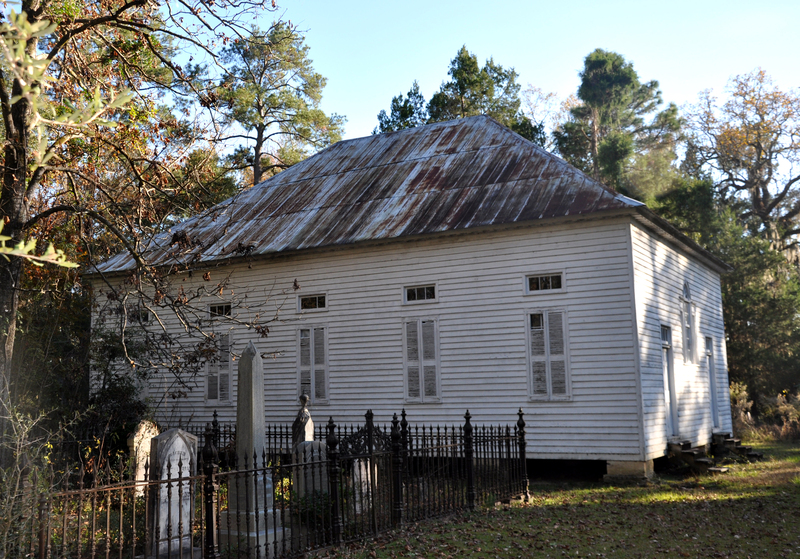 Well back in the Allendale County countryside sits Smyrna Baptist Church. 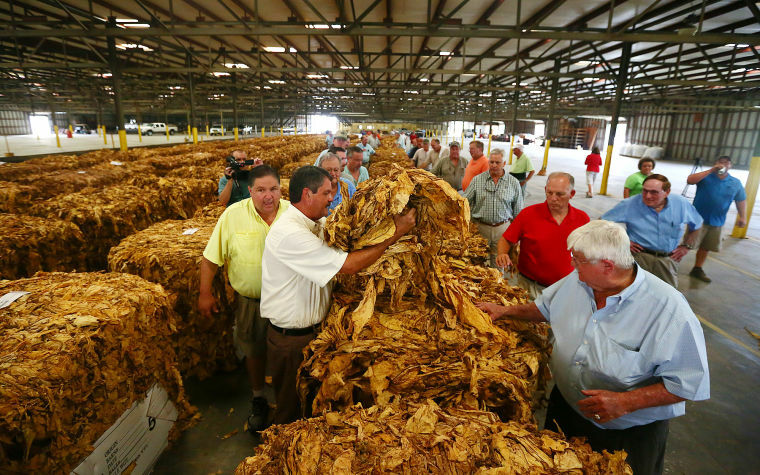 The antebellum church hasn’t held services since 1958 and today has but a single member on its rolls. Yet, there was a time when Smyrna Baptist, like so many rural Southern churches, was a vibrant, thriving house of worship. Today, Hugh Gray, a cotton farmer and former Allendale County councilman, takes it upon himself to keep watch over the church. He grew up attending Smyrna Baptist, his family is buried in its graveyard and he’s purposely kept his name on the church rolls, making him the lone member, even though he attends Beech Branch Baptist Church, near Luray, S.C., about 15 miles away. Gray helps keep up the grounds and watches out for troublemakers. A couple of residents closer to the church call him whenever a vehicle stops at the church. Gray said individuals have broken into the venerable structure, stolen pews and otherwise caused trouble. “More often than not when I get a call that someone’s down here at the church, they’re up to no good,” he said. Constructed somewhere between 1827 and 1848 (dates vary according to sources), Smyrna Baptist was organized in 1827 and originally known as Kirkland Church, after its first minister. By the early 1830s, the church was big enough that it could afford to try three members for heresy regarding communion. In the end, the trio, a husband, wife and the wife’s sister-in-law, were excommunicated and would go on to form a nearby church, Antioch Christian Church, which operated from 1835 until 1939. The windows have louvered shutters with eyebrow-type windows located above each window. The structure’s original roof was covered with metal in the 1970s. 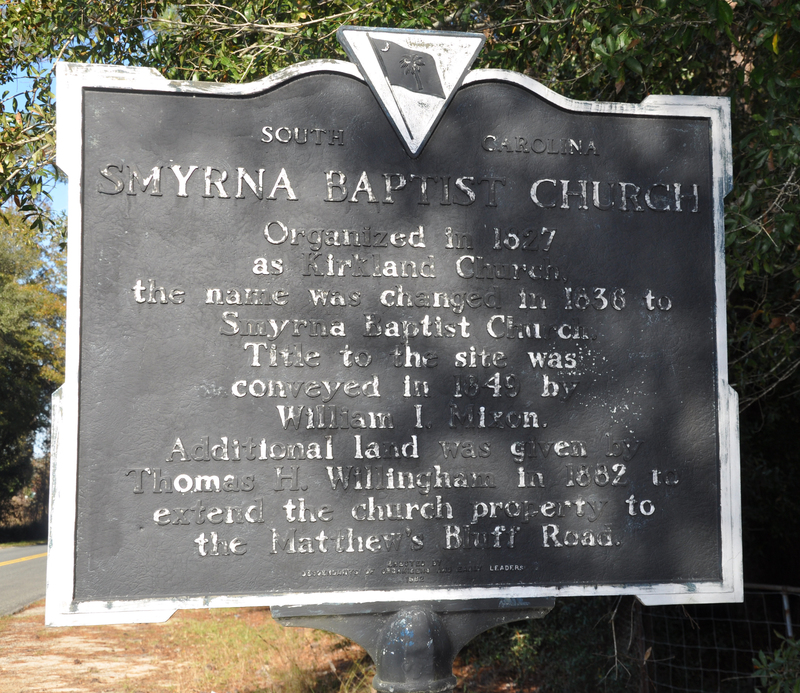 Smyrna Baptist was placed on the National Register of Historic Properties in 1976. Among those buried in its graveyard are Dr. Benjamin Lawton (1822-1879), a local physician and planter who signed the South Carolina Ordinance of Secession and served as a captain in the 3rd South Carolina Cavalry Regiment; and Lt. Col. Benjamin B. Kirkland (1838-1885), who served in the 1st South Carolina Infantry Regiment and was wounded at Second Manassas. There’s also a memorial to William Baker Rice Jr., an Allendale County native who volunteered for the Royal Air Force during World War II and was killed in action on April 28, 1942, over what was then Bengal, India, and is buried in Chittagong War Cemetery, in Chittagong, Bangladesh. The decline of Smyrna Baptist and hundreds of other rural churches across the region reflect the migration that’s taken place during the past century as significant numbers of Southerners have packed up from rustic locations and made their way to larger towns and cities, be they medium-sized polities such as Columbia, SC, Knoxville, Tenn., or Richmond, Va., or large metropolises such as Atlanta, Charlotte and Jacksonville. 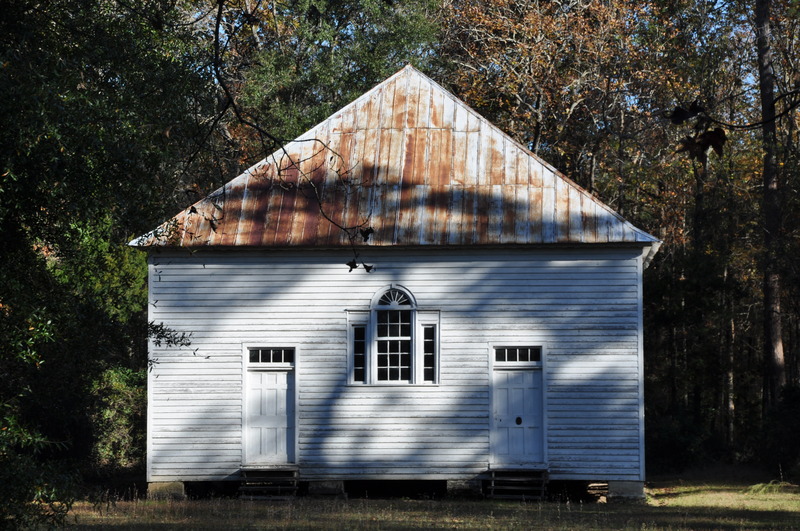 Smyrna Baptist and churches like it reflect an era that’s long passed. Hugh Gray is doing what he can to keep his small church from falling victim to the ravages of time and vandals, but one has to wonder who will take over once he inevitably joins his family in the church’s graveyard at some unknown point in the future. And who is looking after all the many small churches that don’t have someone like Hugh Gray to watch over them? In a move governments around the world could learn from, newly elected Tanzanian President John Magufuli has cancelled Independence Day celebrations, instead ordering money to go toward cleaning the African nation. “It is so shameful that we are spending huge amounts of money to celebrate 54 years of independence when our people are dying of cholera,” Magufuli said in a statement read on state television late Monday. Cholera has killed about 60 people in Tanzania in the past three months, with more than 5,000 cases reported, according to the World Health Organization. Tanzania celebrates its independence from the United Kingdom on Dec. 9. This coming anniversary will mark the first time since gaining independence that Tanzania has not held a celebration. While Mugufuli’s party, Chama Cha Mapinduzi, has governed since colonial rule ended in 1961, the new president, elected last month, appears poised to change direction with the call to clean. Independence Day celebrations are usually marked with a presidential address, a military parade and performances by music groups at the National Stadium in Dar es Salaam, according to the BBC. A spokesman for Magufuli did not say how much would be saved by cancelling Independence Day celebrations, but said the money would be spent on hospitals and the fight against cholera – a major problem in poor areas which lack adequate sanitation. Magufuli, 56, has announced a variety of austerity cuts and crackdowns on public corruption since taking office, including a ban on superfluous foreign travel by government officials. Last week, he ordered the cost of a party to inaugurate the new parliament to be slashed from $100,000 to $7,000, the BBC added. He also fired the head of the main state hospital after finding patients sleeping on the floor during a surprise visit to the facility. Magufuli, first elected to Parliament in 1995, earned a bachelor’s degree in education from the University of Dar es Salaam in 1988. He also earned his master’s and doctorate degrees in chemistry from the University of Dar es Salaam, in 1994 and 2009, respectively. Prior to his election as president, Magufuli served as Minister of Works (2000-2006 and 2010-1015), Minister of Lands and Human Settlement (2006-2008) and Minister of Livestock and Fisheries (2008-2010). It’s difficult to say if the world we live in is any more polarized than that of the past, or if social media has simply magnified the chasms that exist, leaving the appearance of a stark black and white realm when reality has always been varying shades of gray. Take the Syrian refugee crisis. While many US governors practically tumbled over each other in the race to demand that no Syrian refugees be allowed to settle in their states, some on the other side were insistent that any denial of US asylum was outright racism. Both are unfortunate and ill-considered stands. The first I attribute to political posturing. Certainly, it’s not possible or wise to allow a mass influx of immigrants from any nation without proper vetting. That doesn’t mean you shut your borders, however. You certainly don’t rope off your borders to individuals from a specific country because of the actions of one or a few, or because the majority of the individuals in that country are of a specific religion. Humanitarian crises demand extraordinary responses, and the US and other Western nations should step up efforts to aid those in need while ensuring the safety of all concerned. Simply slamming the door shut on those either forced from their country or who have left out of fear is not an appropriate response. On the other hand, we have those who misrepresent the past to manipulate individuals’ feelings in a bid to push an agenda. Consider this headline from a distasteful story that attacks those in the US for failing to open its arms to all Syrian refugees, no questions asked: “Anne Frank Literally Died Because of America’s Anti-Refugee Stance”. John Prager, writing for the online publication Addicting Info, states that Otto Frank, Anne Frank’s father, was denied a visa by the United States, preventing he and his family from escaping the Nazi noose that was tightening around Jews in Europe. 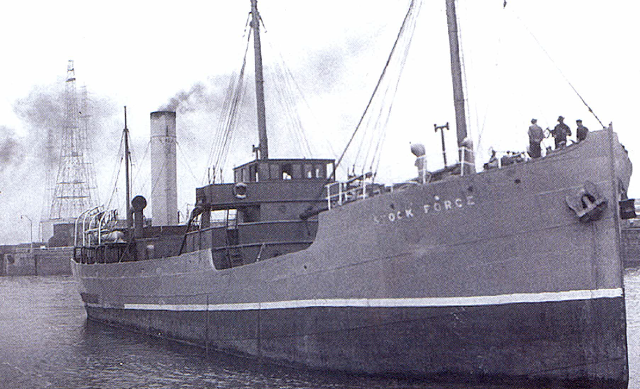 The Franks were captured by the Nazis in Amsterdam in 1944 and Anne and most her family perished, with Anne and her sister Margot dying at the Bergen-Belsen concentration camp in the spring of 1945. Because the US didn’t give the Franks a visa, it is responsible for the family’s death, Prager asserts. The fact is, Anne Frank “literally” died because of the Nazis’ policy of exterminating Jews. American anti-Semitism, anti-Semitism in other countries, and a general unwillingness to open US borders to the tens of millions of other individuals who were displaced or endangered by the Nazis (and Soviets) is a sad reality of the 1930s and ’40s, and one hopes that today’s generation will not repeat the same mistakes. But the US, for all its many flaws, was not “literally” responsible for the death of Anne Frank or other Jews who perished between 1933 and 1945. We could have done more, much more, but we didn’t deploy Einsatzgruppen to kill hundreds of thousands throughout the Baltics and Eastern Europe, we didn’t set up concentration camps and death camps, and we didn’t transport millions in cattle cars from Nazi-created ghettos to those camps, where they were gassed or otherwise killed. 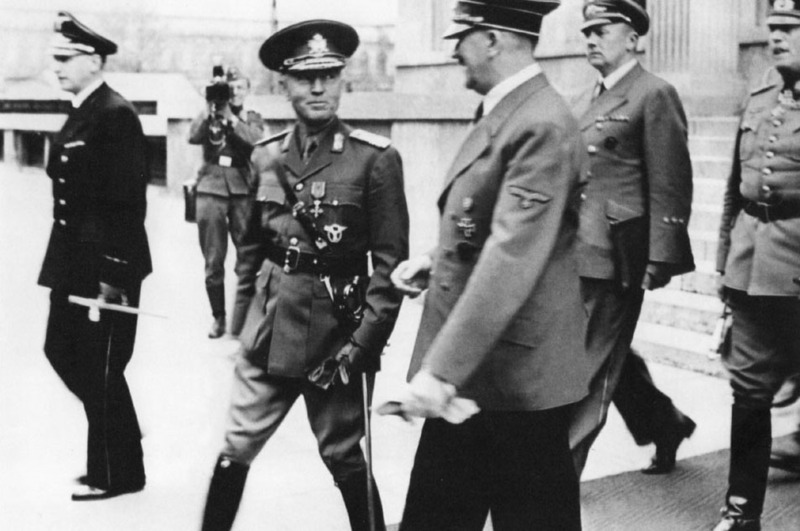 Ultimately, it was the US and other Allied nations that stopped the Nazi death machine. Prager’s appeal to emotion doesn’t stand up under scrutiny, and it doesn’t help us solve the problem at hand. Sprinkled throughout the United States are five-ton granite fountains, remnants of a simpler time. Between 1906 and 1912, the National Humane Alliance presented approximately 125 horse watering troughs to cities and towns across the country. The idea was to instill “ideas of humanity both to the lower animals and to each other,” according to Alliance founder Hermon Lee Ensign. 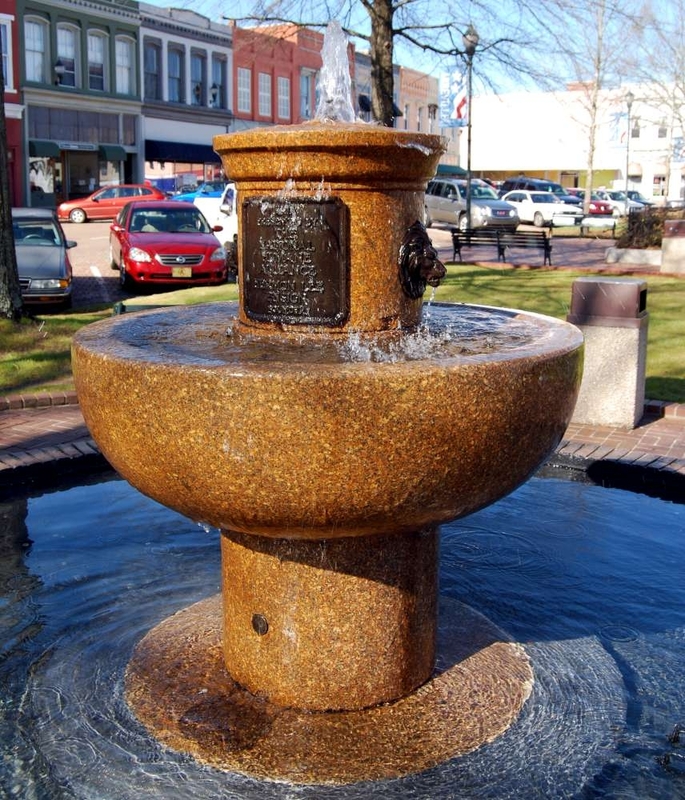 One such fountain still sits where it was originally placed in Abbeville, SC. 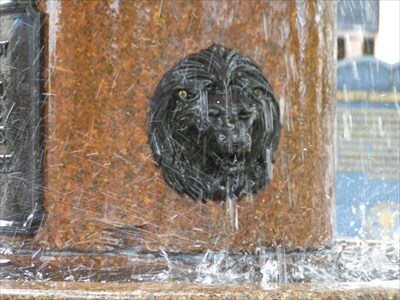 Installed in 1912 in the town square, it was designed so that water flowed from regal lions’ mouths into a basin of polished Maine granite trimmed with bronze. It was designed with an upper bowl, or trough, for horses to drink from and small cups at the bottom for cats and dogs. Birds could also use it, as could humans, who could drink the clean water as it came from the founts. At least one community in each state in the Union, then composed of 48 states, was presented with a fountain, and at least two were placed in Mexico, as well. Fountains were presented to several cities in South Carolina, including two in Columbia and single fountains in Abbeville, Camden, Georgetown and Laurens. 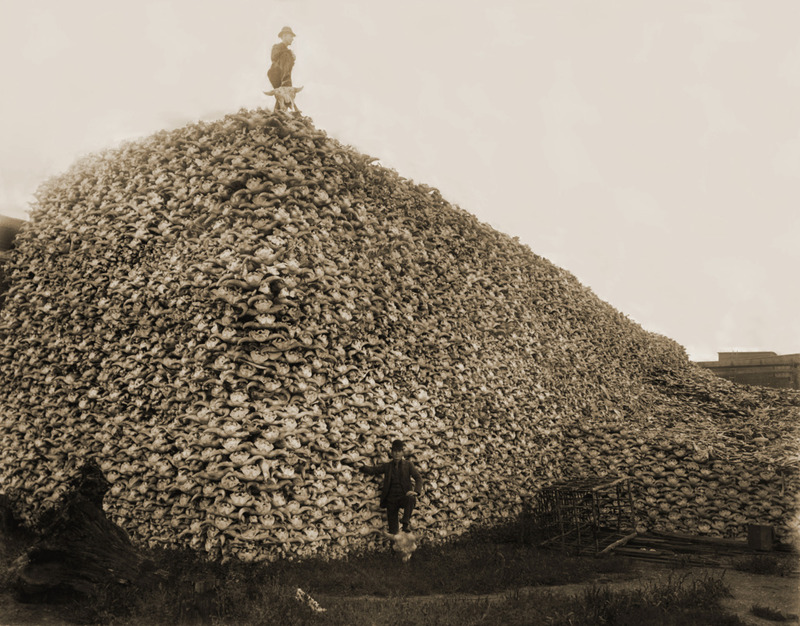 The National Humane Alliance was established in 1897. Ensign, its founder, compiled a moderate fortune from advertising and several inventions in the newspaper business. An individual with a lifelong affection for animals, Ensign had a deep appreciation for their welfare. The National Humane Alliance emphasized the education of people to be kind to one another and considerate of animals. Detail from National Human Alliance fountain in Abbeville, SC. Ensign, who died in 1899, dedicated his fortune to the Alliance, which used the money to fund the granite fountain program. While the fountains aren’t identical, there are many similarities. The granite used in their construction was quarried in Maine and manufactured in the coastal Maine communities of Rockland and Vinalhavan. The large bowls are around six feet across. Most are about six feet tall. They can be found across the country, from San Diego, Calif., to Houlton, Maine, and from Spokane, Wash., to Jacksonville, Fla.
At least 70 fountains still survive, with others likely forgotten in municipality storage. Most have been moved from their original locations, which was often near city or town centers. The irony in the National Humane Alliance’s well-intentioned investment was that as it was donating these beautiful fountains to towns and cities across the country, the need for them was drawing to a close. The United States was rapidly becoming a nation of car enthusiasts, and it wouldn’t be too many years before individuals traveling to town by horse were an anomaly. Astrophysicists have discovered at least one place in the universe that man won’t be looking to colonize any time soon, if ever. 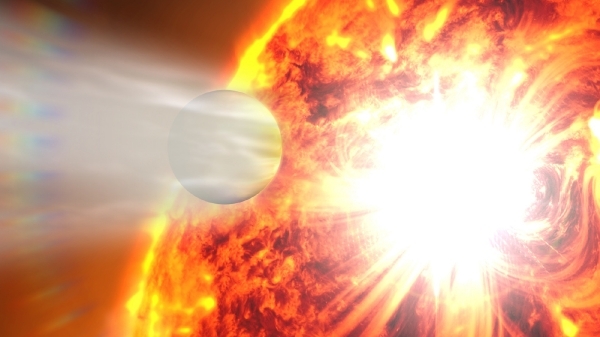 Researchers at the University of Warwick have discovered an exoplanet where winds blow at an astounding 5,400 mph – more than two kilometers per second, and 20 times stronger than the fastest winds ever recorded on Earth, RedOrbit reports. The planet, a “Hot Jupiter-type exoplanet” labeled HD 189733b, is the first world beyond the solar system to have its weather directly mapped and measured, stated lead author Tom Louden and his colleagues in the latest issue of Astrophysical Journal Letters. “While studying the planet, they found winds moving from the day side of the planet to its night side at a velocity seven times the speed of sound,” according to RedOrbit. “Louden and co-author Dr. Peter Wheatley measured the object’s velocity by using high resolution spectroscopy of sodium absorption occurring in its atmosphere. As portions of HD 189733b’s atmosphere moved towards or away from Earth, this wavelength of this feature is altered by the Doppler effect, enabling measurements of its speed,” RedOrbit added. By comparison, the fastest wind gust ever recorded on the surface of the Earth was in 1996 when an unmanned instrument station in Barrow Island, Australia, recorded a 253 mph blast during Typhoon Olivia. Not only is HD 189733b incredibly windy, it possesses other climatic conditions that most folks would consider problematic, as well. The planet, which is approximately 10 percent bigger than Jupiter and 180 times closer to its star, has a surface temperature of roughly 1,200 degrees Celsius. HD 189733b, discovered in 2005, is 63 light-years away from our solar system, in the constellation of Vulpecula, known as the Fox. Its relative closeness to our solar system has made it a popular research subject. One of my many blessings is that my children love the outdoors and wildlife as much as I do. They’re always up for wading in a creek, tramping through the woods or driving to some distant unpopulated region for a gander at local fauna. Yesterday, I was rewarded once again for their willingness to abide by their dad’s need to get outside. While trying to make the best of a wet afternoon we took a drive through rural farmland 15 miles north of home. Along one stretch of rural countryside we saw a red-tailed hawk go hopping across the road. A vehicle came slowly in the other direction and the bird of prey, rather than flying away, bounded off the road and into a ditch. As the other vehicle passed, I pulled my car over and told my girls to take pictures of the hawk, which was about 15 feet away. I then got out of the car and slowly moved toward it. I could tell something wasn’t right, but I expected it to burrow into the nearby hedgerow and thereby elude me. Instead, it stayed where it was, eyeing me warily. I got within about three feet and had one of my daughters bring me a sweatshirt. Given the size of the raptor’s beak and talons, I very carefully tried to wrap the sweatshirt around it. The hawk fell back at first, but didn’t put up too much of a fight. 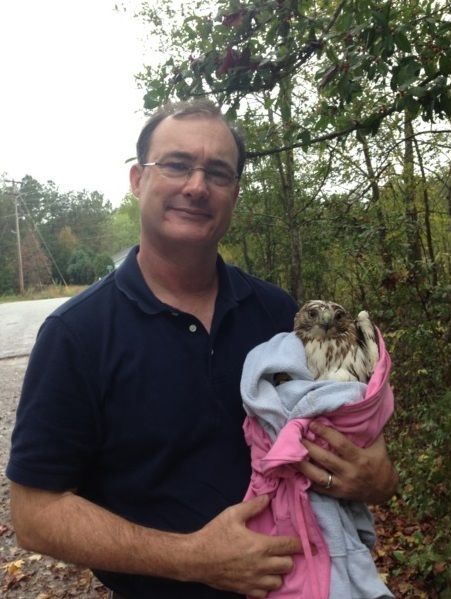 Me with somewhat confused red-tailed hawk. No hawks or humans were harmed in the making of this image. The hawk was wet and cold. We decided that given the weather – cold and rainy with more of the same expected for the foreseeable future – we would take it to a wildlife rescue shelter about 20 miles away. One of my girls brought me another sweatshirt, this one pink, so we could make sure his talons were wrapped up and dad didn’t end up with deep lacerations about his body, and I slowly lowered myself into the car holding the hawk. Gently clutching our new companion with my left hand, I started the car and pulled forward, steering with my right hand. My daughters were transfixed by the bird. Although most of the cinnamon-colored hawk was wrapped up, they could easily see its sharp beak and proud eyes, which gave it a fierce visage. It was, like most birds, incredibly light for its size, weighing no more than 3 or 4 pounds. But it was two feet tall from head to talons, and its wingspan would likely have been at least four feet, had it had an opportunity to show off its plumage. Not surprising given the car’s occupants, it was quickly given a series of names: Cooper (we initially thought it was a Cooper’s Hawk); Cosmo and Xenon (being a noble-looking bird, Daughter No. 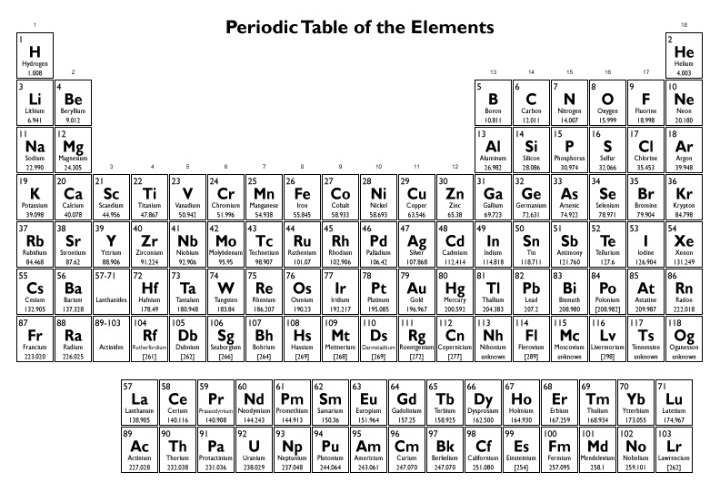 4 thought it should be named for one of the noble gases and helium, neon, krypton and radon weren’t cutting it.) Ultimately, it ended up with three different names – one from each daughter – none of which, of course, the bird showed any interest in responding to. A good portion of the trip was on an Interstate, and while I was busy keeping my eyes either on the road or the bird, hoping it wouldn’t decide to crane its neck around and take a nip at my neck or face, I can only image what fellow drivers thought as they passed our car and caught a glimpse of a middle-aged man driving down the road with a fierce-looking raptor sitting on his lap. 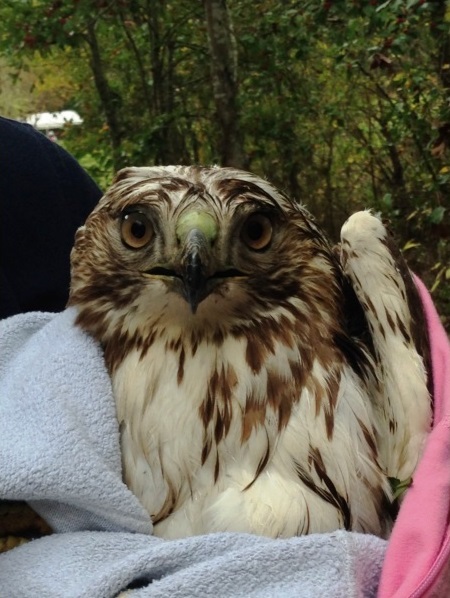 We eventually made our way to the Carolina Wildlife Center with neither man nor hawk suffering injury or embarrassment. As I carried the bird of prey into the center I noticed the other rescued animals on hand, including a baby possum, a squirrel and a blue jay. I somehow resisted the urge to thump my chest, swagger around and crow about how my beast could not only best all the others, but eat each one, as well. Instead, we filled out an information card, thanked them for taking our hawk and went on our way.